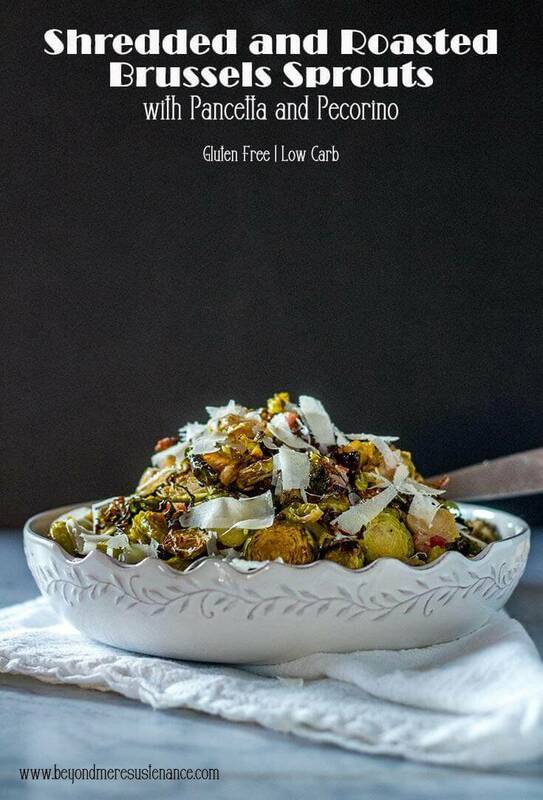 A simple, healthy, and tasty side dish, Roasted Shredded Brussels Sprouts with Pancetta and Pecorino is a perfect side for your Thanksgiving table, or any time your menu calls for it! The 3 individual recipes haven’t gotten much notice, in part due to 3 recipes in 1 post. Google can’t figure it out! AND the post is TOO LONG! I was looking for Thanksgiving sides to share on social media, and realized the recipes just kind of got lost. I made an executive decision to make 3 separate recipes, and link back to the 2017 post. 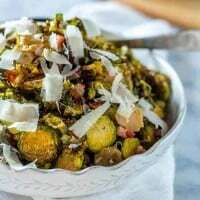 Studies show brussels sprouts are rich in antioxidants, helping to resist chronic disease. Studies suggest they may both protect against cancer, and slow the growth of cancer cells. Those of us eating a healthy diet are aware of the benefits of fiber. Brussels contribute to gut health! I don’t boil and rarely steam our veggies. My preference is to roast them as in my Roasted Miso Glazed Radishes (Asian Style) and Roasted Vegetables With Dukkah. It’s all about flavor! Of course you could sauté these same ingredients and have a delicious dish. You wouldn’t, however, get those deliciously crispy and browned edges… It’s your call. 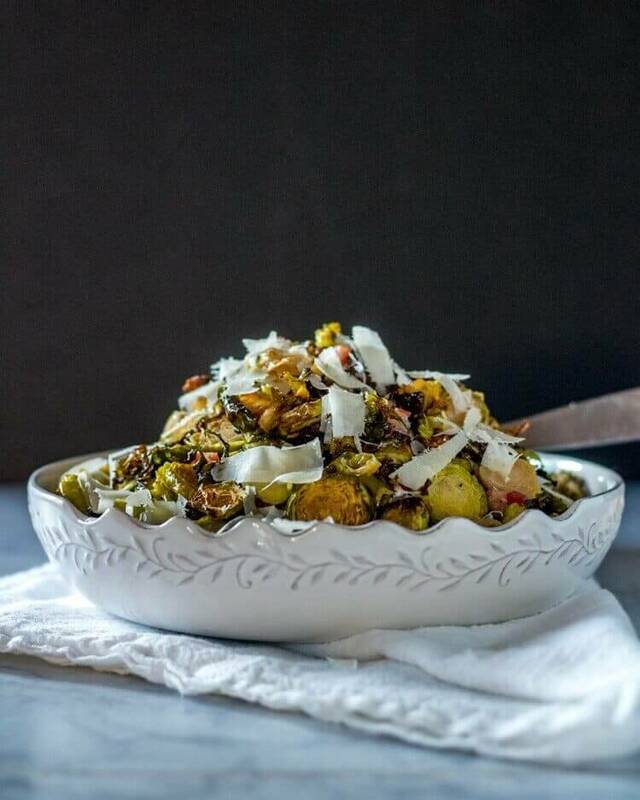 😉 Either way, I hope you’ll give these Shredded and Roasted Brussels Sprouts with Pecorino and Pancetta a try. I experimented with my mandoline (brussels were too small and dangerous to fingers! 😯 ), food processor (way too finely shredded), and finely settled on hand slicing… Yes, I know it’s tedious, but hey, this is a special occasion dish! 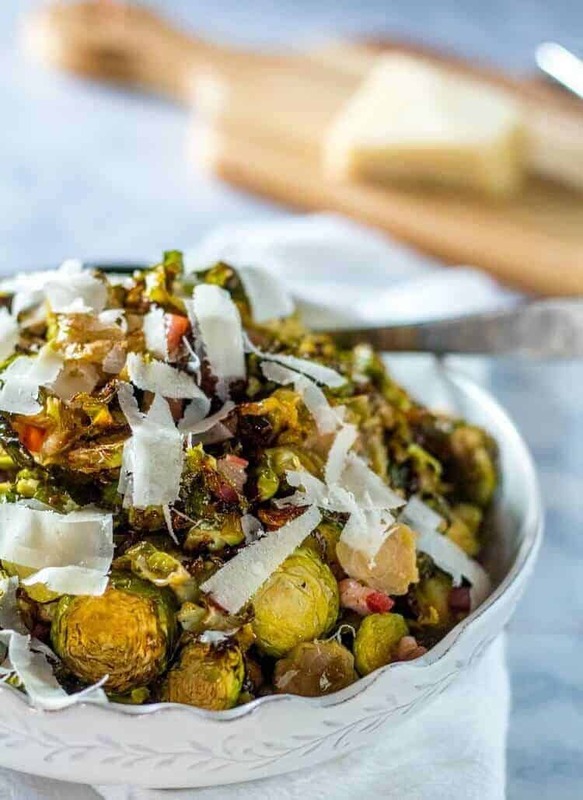 Once the brussels sprouts are finely sliced, drizzle generously with olive oil, add finely diced pancetta (prosciutto is a good substitute), and season with salt and pepper. Get your hands in there, and combine thoroughly. Spread out on a baking sheet. Place in a preheated 400° (375 convection) oven, and roast about 30 minutes until you have those lovely, crispy browned edges. Don’t forget to give it all a stir every 10 minutes or so. This is our favorite way to enjoy brussels sprouts. I hope you’ll give them a try! P.S. 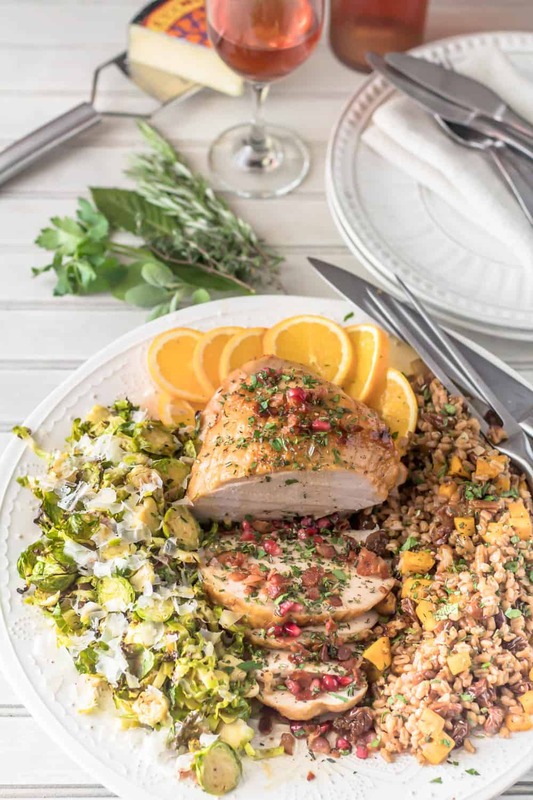 Complete the gorgeous meal shown below with Herbed Farro Dressing with Butternut Squash, Dried Cherries, and Pecans and Herb and Citrus Brined Turkey Breast. Toss the sliced or shredded brussels with olive oil, pancetta, sea salt, and pepper. Roast until edges are dark brown, and thicker parts yield to the fork. They should not be soft. Taste for seasoning. Shave or grate the pecorino over the brussels. Enjoy! I tried shredding the brussels in my food processor, and they were too fine IMHO. The mandoline is another option, but tiny food and sharp mandoline equals danger (at least for this home cook!). I loved the results when I sliced each brussel sprout by hand as thin as I could comfortably get them. Prosciutto is another good option (in place of pancetta). I use 5 thin slices, and chop it up, then toss it with the sliced brussels. Pecorino is supposed to be sheep's milk, but there are impostors out there. Be sure to use a good, aged hard cheese. Parmesan and asiago will also work. Macronutrients (approximation from MyFitnessPal.com): 202 calories; 9 g protein; 10 g carbohydrates; 15 g fat. If making the entire A Cozy Thanksgiving Dinner For Two, the brussels can go into the oven when the roasted root veggies come out. Since the turkey needs to rest, you should have plenty of time to get everything done and ready to serve in about 2 hours. Beautiful photos Tamara. I think it's time I tried out a more adventurous recipe for sprouts and I think this one sounds fantastic.